The sniper attack in Dallas marks&nbsp;the deadliest day for police&nbsp;in the U.S. since the terrorist attacks on September 11, 2001. Dallas police identified Micah Xavier Johnson, a 25-year-old Army veteran, as the lone gunman in the shooting. Detectives found bomb-making materials during a search of his home. Johnson said he was upset about recent police shootings and wanted to kill white people, especially white officers, the police chief said. Officers detonated a robot bomb to kill Johnson after attempting to negotiate with him. The sniper attack in Dallas marks the deadliest day for police in the U.S. since the terrorist attacks on September 11, 2001. DALLAS ― A day after a lone gunman shot and killed five police officers and injured another seven during a Black Lives Matter protest in Dallas, marking the deadliest day for police in the U.S. since Sept. 11, Texas Gov. Greg Abbott praised the bravery of the police force and called for a return to normalcy. The past 24 hours have been “a veritable tale of two cities,” Abbott said in a news conference Friday evening. “On the one hand, it’s been the tale of heroism of police officers. At the same time, it’s been a tale of cowardice by an assassin." "We need to show that we are not harmed, damaged or altered by this cowardly attack," he added. The gunman, Micah Xavier Johnson, 25, who was killed by police, was an army veteran who said he “wanted to kill white people, especially white officers,” according to the Dallas Police Department. He had no criminal history, officials said. The attack, which also injured two civilians, came during a violent week that also saw police shootings of black men in Louisiana and Minnesota. Officers exchanged gunfire with Johnson after negotiating with him for several hours. They ultimately detonated C4 plastic explosive strapped to a robot bomb-detector, killing Johnson. Detectives later searched his house and found bomb-making materials, ammunition, rifles, ballistic vests and a personal journal containing “combat tactics,” officials said. Johnson “knew how to do his damage, but we did damage to him as well,” Mayor Mike Rawlings said. Three additional people who had been detained as suspects were released Friday, Abbott said. Brent Thompson, 43, who worked for the Dallas Area Rapid Transit force, was killed in the attack, as were Lorne Ahrens, 48, Michael Krol, 40, Michael Smith, 55, and Patrick Zamarripa, 32, of the Dallas Police Department. Police Chief David Brown attended the vigil. People filled Thanks-Giving Square, in the center of downtown Dallas, midday Friday for a vigil and interfaith service. After the vigil ended, the downtown area was essentially empty save for the officers ― wearing black bars over their badges ― posted up on every block. Some lined up to give blood at an impromptu donation clinic inside City Hall. All signs pointed to the Black Lives Matter demonstration having been peaceful throughout Thursday evening. The police department Twitter account included posts about “men, women, boys and girls” gathered in solidarity, while other photos show officers posing with marchers, including a state senator. Police attempt to calm the crowd as someone is arrested following the sniper shooting in Dallas on Thursday. 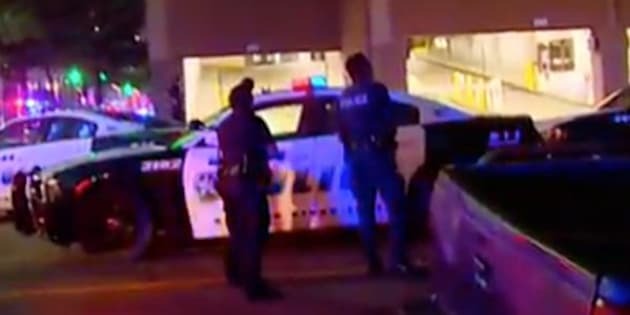 Dramatic video of the shooting showed dozens of officers converging on several buildings in downtown Dallas, including a parking garage. In another, several shots can be heard ringing out as sirens blare in the background. President Barack Obama addressed the shootings from Warsaw, Poland, where he’d been attending a meeting with NATO officials. 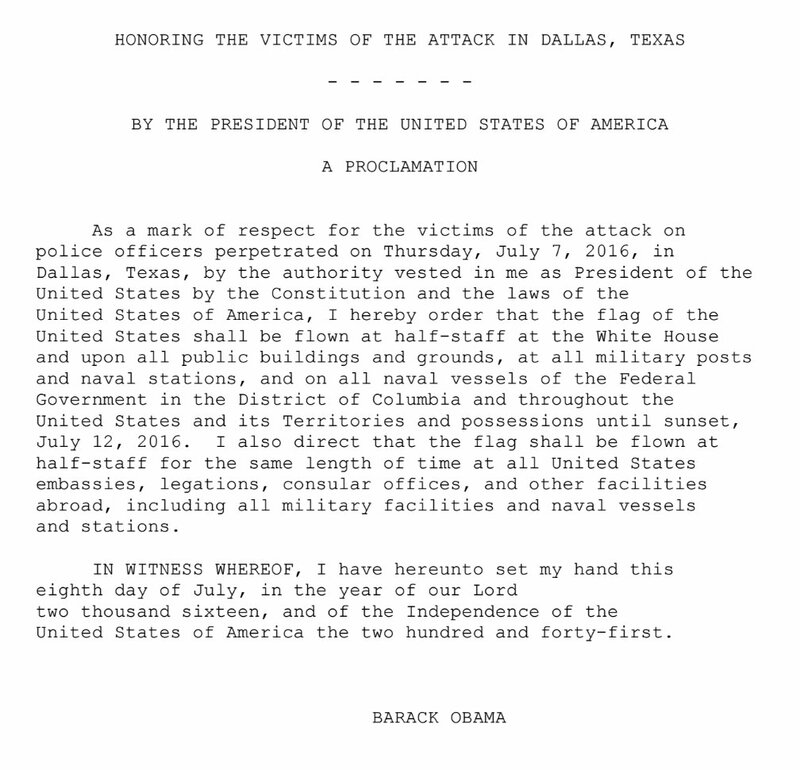 Obama on Friday ordered all flags to stand at half-staff through July 12 as a mark of respect for the victims. A police officer stands guard near the site of the vigil Friday. In a press conference, Attorney General Loretta Lynch urged unity. “Today and every day we are one nation, we are one people, and we stand together,” she said.